Monster Number Trivia - 301 different members have posted on this thread. O6	680	Aug 20, 2013	Rob D.
44	518	Dec 28, 2011	Scott L.
1 point for everyone else. The highest monster number is therefore 1000. Occasionally I receive inquiries from collectors who just can't stand the notoriety that comes with having a posted Monster Number. I do respect their "unwarranted" need for privacy though. 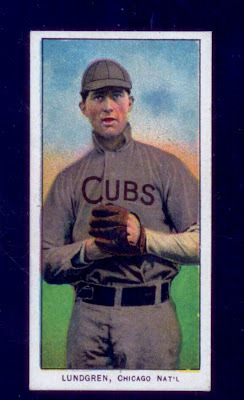 The goal of this thread was never to identify where all 2,834,216 cards reside, but going forward I will offer an "Anonymous" listing option. Only you will know who you are, as I will try to forget. Of course this option will require that your posting be done in private, via PM, with the doors closed. If there is demand for this new service, it may be necessary to add a number, letter or punctuation to your listing. If possible, I will even offer an emoticon option such as "Anonymous ". Just let me know in private, if you are interested in this service. I'll be home tonight. Condition and back variations are not factors in your basic monster number. Depending on interest back monster numbers (i.e. Polar Bear Monster numbers) could be considered in the future. If you have duplicates, they are considered 2nd sets. Each set you own has its own Monster number. For example I currently have 555 total cards, including 36 duplicates and 1 triplicate. I do not own any of the Big Four. Therefore, my monster numbers are 518 for Set 1, 36 for Set 2 and 1 for Set 3. Let's just get started with your highest Monster Number only. I am also suggesting that you share scans of a few of your cards. No prizes, but I will tabulate and post a listing of everyone's Monster Number here in the original post and update the list periodically forever or until the cows come home, whichever comes first. Guess my highest possible total would be 998, as there wouldn't be a Demmitt or O'Hara/St. Louis in my range of cards. Anything else would be possible. Great topic. I've always thought about a points system based on how rare a card is or how rare the back is etc. A system full of multipliers. Endless possibilities. Cobb Green vs. Red, Polar Bear vs. Lenox, VG vs. EX. Bonus points for Wagner, Plank etc. SLers - OM vs. Piedmont. I wish I had the time to develop a program to do this - I once had the time... I've seen websites and spreadsheets that kinda do this. clever mathematics skills yielding the 1000 number! I'm only at 13.. but I've only been buying T206s since Sept. so..... here are my two best (so far) and my worst. Last edited by wonkaticket; 12-23-2011 at 12:01 PM. John, you should get that Plank put in a PSA holder - whoever currently owns the Wagner would probably pay good money for it as a companion piece with similar history. Wow!!! Very nice group.. The Plank is stunning!!! what was the "alt" on it??? Last edited by atx840; 12-23-2011 at 01:27 PM. I have no aspirations above the magical number 520; currently I sit at 189. Reg, the corners were rebuilt and a spot of blue to the left of Planks head was carefully painted in dot by dot by a restoration company. Scott different Plank than mine, that Plank is a Piedmont 150 one of the 3 or so known. If I count extras I can add another 300+ cards. Here are some of the PSA examples in my set....I do this only bum Sloate out I know he was getting tired of T206's on the board. Last edited by wonkaticket; 07-06-2012 at 11:08 PM. Sitting on 500 right now. John, I love the way you've paid such careful attention to color, registration and white borders. They all look great. I had no idea a restorer had gotten hold of a T206 Plank. Personally, I have no problem at all with restoration - it's considered an improvement in almost every other collecting environment - it's just the ambiguous 'AUTH' that troubles me. Your Plank looks great. I was just messing around with the Plank comment - is there really a companion to the Gretzky Wagner that was done in the same timeframe? Scott, thanks I have spent years cherry picking tossed back 6's for 4's in some cases doubt it will be noticed if and when I sell but it made a difference to me. Yes there is in fact a sheet mate to our hobby's most famous trimmed card. One of the few cards I regret not pulling the trigger on in my life. 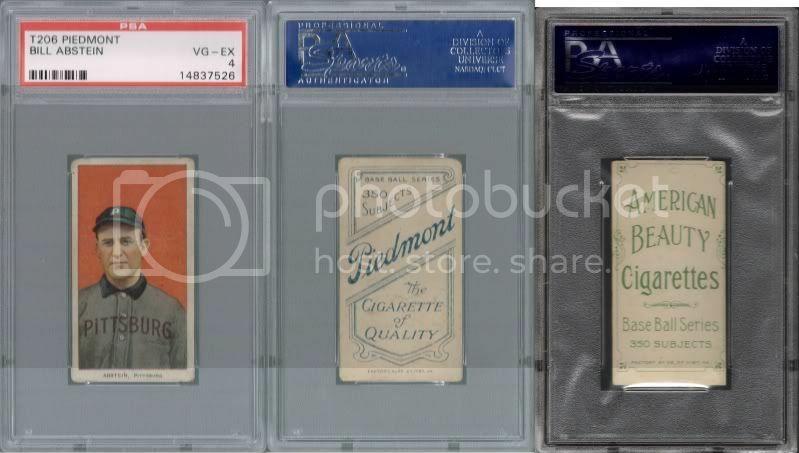 Noticed how Plank is AUTH/Altered and our hobby icon is a PSA 8 both came from the same sheet go figure...got to love this hobby. Last edited by wonkaticket; 12-23-2011 at 02:06 PM. Thanks for sharing - I had no idea this card existed. Last edited by Texxxx; 07-28-2013 at 08:31 PM. I would like to reach 520 someday and my goal for the end of this year was 260. Picked up #260 last month after 4.5 years of working on the Monster. As far as Set #2 or #3, it would take to long to figure that out since I have a lot of multiples of Cleveland players with different backs and I'm doing a back set along with my basic set. If I hadn't bought duplicates and certain backs of some players my number would be at 380. Passion or Obsession........its a thin line. Each with it's own Magie. Last edited by Phillies*phan; 12-24-2011 at 07:45 AM. Zero should probably be dropped as a qualifying set, making a total of 24 so far. Is there an existentialist out there to affirm my ruling on the zero set? Will post the Top 20, when we get to 50 total numbers. Thanks for your participation and scans. would you mind checking the backs of your Piedmonts, Old Mills and Hindu backed cards to see how many and who has a rubber stamp from Howe McCormick, 500 W. Main St., Gainesville, Fla? I know I've pestered/bothered/annoyed most of you previously, but this seems to be the largest gathering of T206 collectors on the board at one time in one spot, so thought I'd beat the dead horse again. If you're interested in selling/trading, please let me know. If not, I'd just like to know what exists out there. I keep a list of all the known examples out there, so I would still have something to pursue, and I've learned my lesson ... I'll keep any replies to myself. Merry Christmas, Happy Hanukkah, Merry Kwanza and Happy Festivus. 15 I just started this year and only collect Pirates, so my set will probably top out at 18. 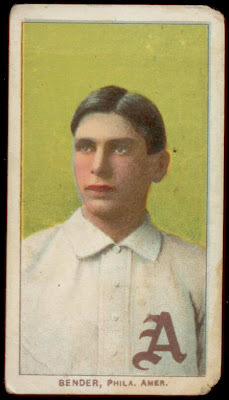 I have a few non-Pittsburg cards, but they are not part of my set. I will eventually have over 100 different Pittsburgers, but I'll still be at 18. I was able to pick up a few players with multiple backs thanks to the collectors here. Only 523 to go. Cobb will lead the way. Yeah, and you're trying to sell it, so you only get credit for 1/2. My set is in flux, but my keepers are a green Cobb, O'Hara St. Louis, Elberfeld Washington, ghost Schlei and Kleinow Boston. These were tough the first time around, so not letting them go this time. Put me down for a '5'. Shouldn't the goal be 258 for a Pittsburg set? inherent creative impulses. I hope this is helpful to you, Frank. The bottom line or more appropriately the summation of your input leaves nearly 7 billion people hanging, not knowing whether they are proud owners of T206 sets (albeit with Monster Numbers of 0), or whether they should continue their impoverished lives oblivious to this privileged subset of humanity with Monster numbers greater than or equal to one. Last edited by frankbmd; 12-24-2011 at 04:52 PM. But gratefully, I am no existentialist. great having you on board. Ted good to see you got your Magie I just noticed your count congrats I know you were looking for one. What condition BTW? If you're gonna go with a point system, why not use the PSA weight system? Having a Hall of Famer, or Southern Leaguer should easily count for more than having a common. Obviously the Wagner, Plank and Magie should count for a bit more than 10 points though.. The concept could get very complicated with Hall of Famers, Southern Leaguers, different backs and different grades, etc, etc, etc. I wanted to keep it simple enough to get quick responses not requiring a calculator. I considered the PSA weighting system, but found it a bit to complicated for a quick answer and weighting Wagner a 10 just isn't fair. My other goal was to have a maximum score of 1000, which has not yet been reported. The thread seems to be getting a good response and your input is appreciated. To keep it simple, everything should get a '1'. To go one additional level, you could have the three obvious tiers (O'Hara and Demmitt St. Louis are tier 3), and still keeping it simple, you could add a fourth tier of items such as Elberfeld/Washington, Kleinow/Boston, SL'ers with Old Mill backs, etc. The above would be simple. Adding back multipliers would make it difficult for some board members to do the math. In any event, your thread is fun, but if you really want to tabulate results, you need to make it more realistic. Reg, the corners were rebuilt and a spot of blue to the left of Planks head was carefully painted in dot by dot by a restoration company. Given that this card is already stuck with an 'AUTH-Altered' designation, wouldn't it be worth getting such a restoration company to re-paint the erased background area? If it were my card, I think I would. 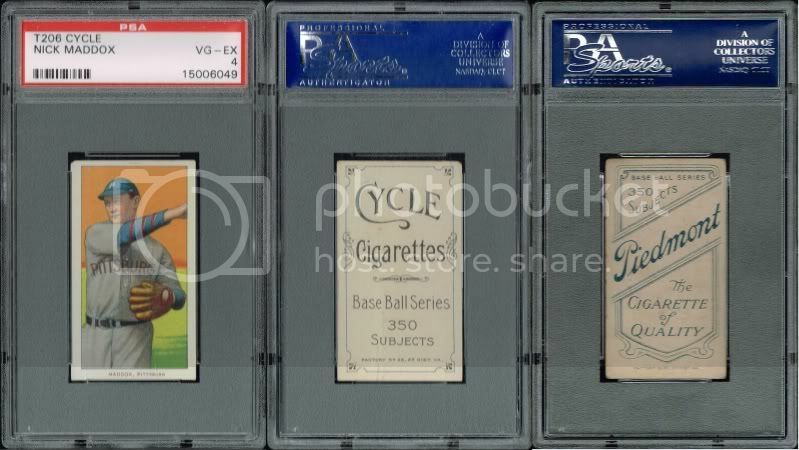 collecting T206, 1940 Play Ball, 1947-66 Exhibits, and 1952 Bowman. e-mails preferred over PM.